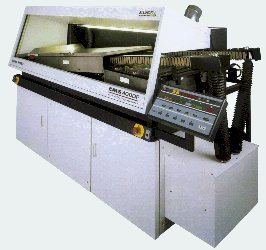 The Kappa 330 automatic cut and strip machine for wire up to 16mm² and multi-core cables, with a quick job changeover. With Teflon, PTFE, PVC or similar insulation material. The latest Lead Free compatible wave-soldering machine, USing Nihon Superior Co. Ltd SN100Csolder. Paramount uses a continuous finger conveyor with motorised width adjustment, allowing the full flexibility required for prototype runs through to full batch quantities. No matter whether you need 1 or 1000 boards Paramount can wave solder your assembly.